Days continue to be above the normal for early summer. But,after 8 days,as on today,4th March,we see shades of "below normal" day temperatures along the western region and North-West India. The progressive Northward push of the "Above Normal" heat has been halted. This is well noticed when anomaly maps of the 1st, ( in my previous blog), and 4th. are compared. And the respite factor can only be an effective W.D. Yesterday (3rd. ), Asia reached its 40c mark, at Nang Rong,Thailand. Todays day temperature map from IMD shows Anantpur as the highest in India at 39.4c. Many of the cities which earlier threatened to touch 40c soon have come down to 35-37c levels. Today Nagpur was 38.6c, Akola 36.4 and Baroda 34.6c. This leaves my blog poll still open. Meanwhile, an IMD outlook indicates the arrival of a fresh western disturbance over the western Himalayan and Punjab regions. 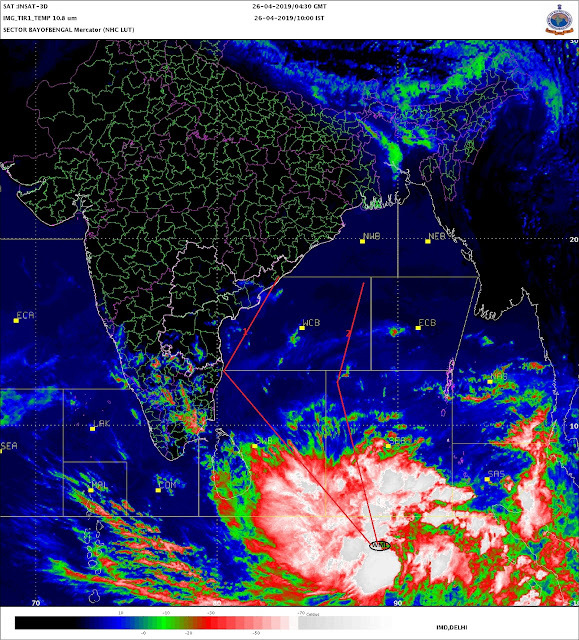 Hence, fairly good rains are expected in the north-Western India next few days. Ahead, there seems to be more releif in terms of summer heat creeping Northwards soon. ECMWF predicts another fairly effective W.D.over North India from the 12th. of March. Mumbai, which had shot up to 37.5c on 2 consecutive days on 27/28 February,and later climbed down to 35.5c on the 1st., was reasonably comfortable at 30c today. I dont expect sticky humid weather till mid-March at least. But February has been warm and hot for Mumbai. Right thru the month the temperatures have been above normal, and towards the fag end of the month, the hot red patch is bigger. Clicking on the diagram, will bring details like the mean departure for the month at +0.95c.